When the heart is loyal and love is true. Magic persists in enduring devotion. Commitment - to faith, to values, to family, to friends - defines the arc of being as the heart, mind, and soul are binded to that which has graced us with cause and purpose. Love is rewarded with devotion and devotion carries love to the wonderful prospect of growing old with your devoted. On our journey towards marriage, Kyle and I searched for the perfect statement of devotion to each other. Loyalty has no bounds; we partnered with our friends at Tacori, not only because their designs are inimitably gorgeous, but they also have been a truly authentic family to Honey & Silk since the very beginning. 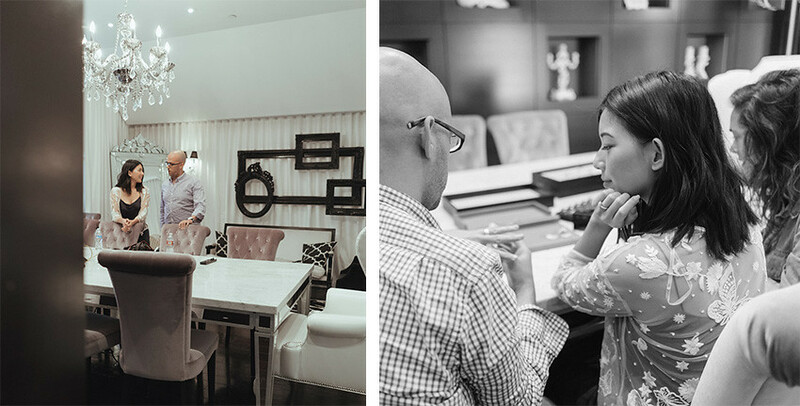 The expert artisans and head designer worked with Kyle and me to custom design our wedding bands and the fairytale process was once-in-a-lifetime. Shielded in ivied red brick and deliberately bare of name, the Tacori Design Studios sits discreetly in a cozy neighborhood in Los Angeles just an easy 20-minute drive from our home. A security guard escorts you inside, because diamonds are aplenty when every piece of Tacori jewelry is handcrafted right in this very building. The process is systematic, thorough, and magnificent. 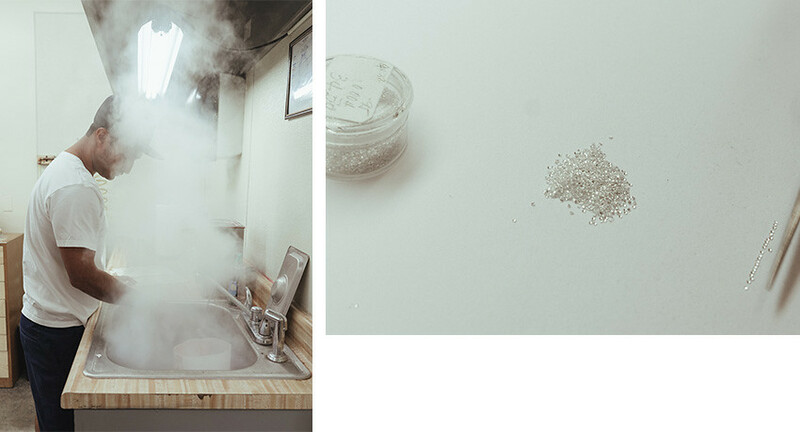 In a bright room, a woman meticulously hand-selects hundreds of micro diamonds with an ease of automation that comes with years of experience, while a gentleman, amongst rows of goldsmiths in the middle of the open hall, polishes a setting by hand and magnifiers. 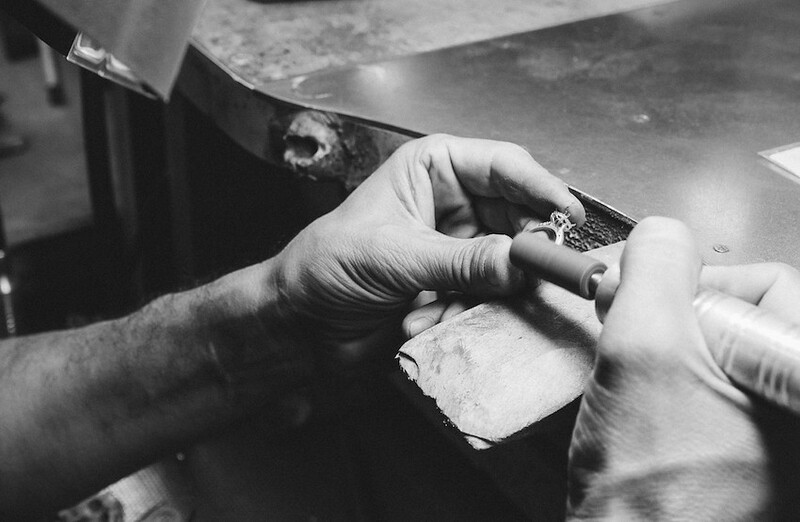 Most of the artisans have been Tacori for decades, which makes them as close to family as my own siblings and I. The custom design process starts in the glamorous Chandelier Room, where a sleek marble surface and an array of great lighting complete the perfect ambiance to showcase their dazzling designs. Pro-tip: request to see their current wedding ring styles to have yourself a dream-like play date with diamonds and more diamonds. I browsed through towers of diamond rings for inspiration (and sometimes just for fun). 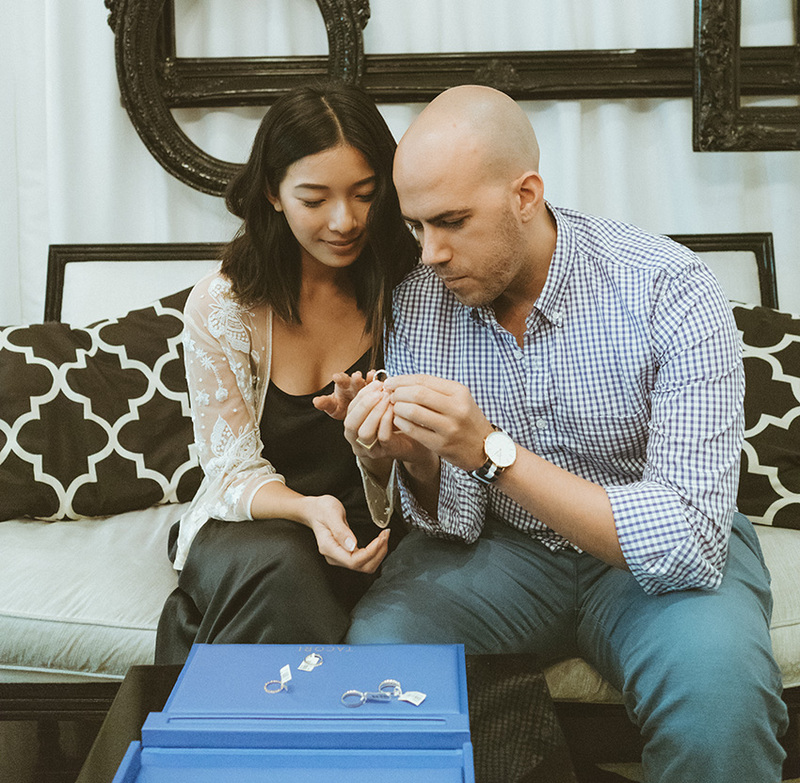 Once Kyle and I had our vision for our wedding bands, their down-to-earth Head Designer Garo stepped in to discuss our personalized designs and also where to find the best Lebanese food in town. The inspiration for my wedding bands derived from the romance of eras past, while Kyle sought family and legacy in his creation. Tacori personified our devotion to each other in timeless objets d'art and left an everlasting memory in the journey of us. A closer look at our Tacori wedding rings will be revealed in the next post! All photos by Tommy Lei.